Realizing that there are a lot more higher handicappers out there, manufacturers go to great lengths to have their engineers come up with all kinds of high tech options for their game improvement models of irons. Sometimes like the cases with the Callaway RAZR XF and the TaylorMade RocketBallz Max, this means some players may have to shell out up to $1,400 to put them in their bags. 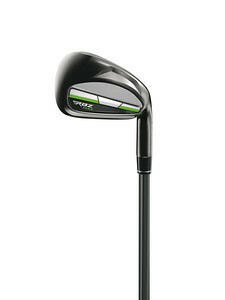 The Callaway RAZR XF is a two-piece iron with a forged 1025 carbon steel body and a Carpenter 455 steel face. The moment of interia in the XF model is reportedly the highest of any in the company’s line. The RAZR X puts 30 grams more weight in the cavity to help launch the ball higher and has stronger lofts that previous Callaway irons. The RAZR X Black has a longer hosel with stronger lofts for the 7, 8 and 9 irons. A medallion in the cavity dampens vibration. The RAZR X HL feature a wider sole and the center of gravity is deeper to hit the ball higher. The TaylorMade Rocketballz Max feature tungsten weighs inside the hollow areas of the hole, mostly for heel and toe, to improve performance on mishits. To aid these players who are mostly slicers, the toe area is stiffen to help promotre m ore of a draw trajectory. The large face on the TaylorMade RocketBallsz helps create a springlike effect and the long irons feature a hollow construction. The Nike VR-S forged uses a special alloy to produce a thinner face and places grooves closer together than is conventional to create more spin. To assist players who tend to hit shots low and toward the heel, the face of the Nike VR-S designed to maximize results for them. The Mizuno JPX-800 features “harmonic impact technology” for sound and feel. The JPX-800 HD offers same option with an extra-wide sole. The Ping G20 has a thinner face and a multimaterial cavity badge in the heel and toe designed to improve feel and sound. The Ping K15 features a titanium face that allows more weight to be moved to perimeter to aid mishits. The Wilson Ci11 also moved weight to the toe and heel and features a urethane badge behind the impact zone to reduce vibration. The Adams Idea a 12 OS features a revamped back cavity that allow more weight to be moved to the perimeter and is integrated with hybrids and hybrid-like irons. Continuing its lighter is better theme, the Cleveland CG Black features a lighter titanium face.